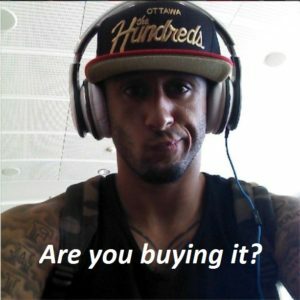 You are here: Home / Sales Leadership / Colin Kaepernick Would be a Terrible Salesman! One of the most controvers ial athletes of our age, no matter which side of the fence you land on, you likely have some very strong opinions about Colin Kaepernick. However, that is not the point of this post. Hate it or love it, the ex-49ers quarterback would be a terrible salesman. You may be asking how and why this is the case? Keep reading. One of the most vital elements of being an effective salesman lies in knowing your audience. This is the foundation of all sales goals as, in order to sell anything, there must be a clearly defined demographic with regards to who will be interested in buying it. For instance, if your audience is the type to get highly offended over political matters, you may need to find a less abrasive method of gaining their attention. Perhaps, one of Kaepernick’s biggest mistakes was to include his protest as a part of the game. Moreover, to this very day, there is still some discrepancy with regards to what Colin’s ultimate message was. However, had he done a better job of this by, perhaps, releasing a well-thought out personal statement beforehand, perhaps his protest would have been better received. Furthermore, Kaepernick also failed miserably at asking for “the sale”. Indeed, while the entire world is aware of the fact that he is protesting racism in some capacity, very few seem to understand what he was asking or even how to help moving forward. By skipping this step, he left his actions open to interpretation and ultimately served to undermine the message of those he was trying to help. Overall, everything is sales. No matter if you feel police brutality to be a worthy cause, the way Colin Kaepernick went about his protest is the real reason none of his concerns received any real attention. Rather than a simple protest before a game, perhaps, Kaepernick should have gone all the way by having an event and starting a foundation in order to garner funds and support for his cause. Either way, it is far too late for Kaepernick at this point. The purpose of this post is so the rest of us don’t make the same mistakes.